Dog-opoly is a tail-wagging good time. Buy your favorite dogs, arranged around the board from Chihuahua to Great Dane. You may become the proud owner of the neighborhood butcher shop or the ever popular fire hydrant! Buy Dog Houses and trade them in for Big Bones. Collect $200 every time you pass Go Fetch!...or pay $200 because you have fleas! 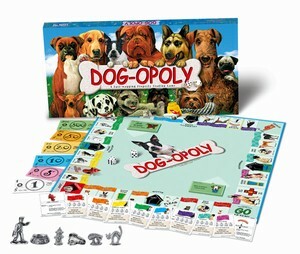 Dog-opoly is a game that celebrates our fabulous four-legged friends. Fun for family and friends. The perfect gift for any dog lover. For ages 8 and up, 2 to 6 players.